Capt. Jolana Fedorkova, Capt. Jan Sulc, Capt. Miroslava Stenclova and 1st Lt. Denisa Smitalova, of the Czech Republic Armed Forces, look at some materials during the annual Texas Military Forces Public Affairs Conference. Scientist and inventor Alexander Graham Bell once said, "great discoveries and improvements invariably involve the cooperation of many minds." For the military public affairs practitioners of Texas, Chile, The Czech Republic, Puerto Rico and various U.S. states, this cooperation came in the form of the annual Texas Military Forces Public Affairs Conference. Held Feb. 23-24, this international event presented a remarkable opportunity for military experts to share their experiences and values with each other in an open workshop environment. "Communication is what we do," said Air Force Chief Master Sgt. Gonda E. Moncada, Public Affairs Chief for the State Public Affairs Office. "The importance of doing that right cannot be overstated. Coming together this week with other communicators from other states and other countries gave us the opportunity to hone our skills and benchmark those ideas that have worked for others." Activities for the two-day conference included public affairs presentations from the representatives, future mission planning, and discussions on the role of public affairs in military operations. Sharing creative briefings and video projects, the participants all learned new things about their international brethren. "What I find interesting," said Capt. Jan ŠULC, public affairs officer for the General Staff of the Czech Armed Forces, "is that you are able to make the message serious but you can deal it in a funny way that's perfect. You will find the audience this way." It wasn't all classroom discussion, as day two offered attendees a special tour of the Texas Military Forces Joint Operations Center via two UH-60 Black Hawk helicopters. Throughout the conference, all participants came to learn they had more in common in their military roles than they initially thought. "The most important for me," said ŠULC, "is we are working on the same issues and we find similar challenges. You need to deal with internal public. You need to show how we are here for the public." "Our job, our mission, is to help them," said Lt. Col. Pablo Müller Barberia, public affairs officer for the Department of Communications - Army, in Santiago, Chile. "We give peace, security and defense." The conference, which capitalizes on the State Partnership Program pairing Texas and the Czech Republic in 1993 and Texas with Chile in May of 2009, reinforces the established strong bonds of training and cooperation. In their almost 17 years of partnership, Texas and the Czech Republic have shared host duties, training opportunities and troop commitments in such exercises as medical certifications, combat instruction and F-16 aircraft demonstrations. In addition to the Czech and Chilean dignitaries, the conference also boasted a representative from the Puerto Rican Army National Guard. 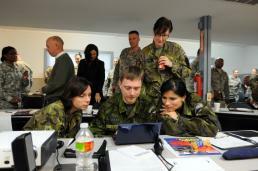 "I get to network with more public affairs professionals in my field," said Staff Sgt. Luis E. Orengo, Operations NCO for the 113th Mobile Public Affairs Detachment. Orengo also serves as the public affairs specialist for the Puerto Rican National Guard, working directly for the Adjutant General of Puerto Rico. "I'm very glad," said Orengo. "Having this kind of experience that bonds us together gives us also the freedom of mind to do our stuff and you have somebody to rely on. If I have a problem now, I have the confidence to call Col. Meehan or anybody here." Beyond attending the conference as a public affairs practitioner, Orengo also served as translator for the Chilean team. Attendees, during their week-long stay in the country, also got the opportunity to explore central and south Texas, visiting Austin, San Marcos and San Antonio. "It's a good experience for me," said Müller. "This my first time in Austin; it's a great city." "First time for me not only in Texas, but also the U.S.A.," said ŠULC. "It was really beneficial for me." Having enjoyed the journey and contacts made, our international partners look forward to sending their peers and comrades to future goodwill events. "I think that it will also be important for my colleagues," said ŠULC, "to have the chance to come next time." With fresh contacts made and old friendships renewed, this year's conference successfully sustained the benevolent relationships that will only continue to grow. "We were delighted to welcome our State Partnership Program partners from Chile and the Czech Republic," said Moncada, "and hope that they enjoyed themselves as much as we did."